Every weekend in Australia from summer to winter, all manner of outdoor, sports and adventure loving enthusiasts head off to enjoy the great outdoors. From dirt bike, Quad and mountain bike riders to kayakers, hikers and triathletes. While the journey to your adventure destination can be part of the fun, getting to and from the location, arranging accommodation, off-loading equipment, securely storing and transporting this equipment can be both hard work, stressful and expensive. That is where the Toy Hauler Caravan comes in! So what is a Toy Hauler Caravan? Imagine packing all your gear once, taking your time to get to your destination, stopping when you want, having accommodation all sorted when you get there … AND with all your adventure equipment with you safe, secure and undamaged. A Toy Hauler Caravan combines a mobile living space with an equipment ‘hauling’ space (or as some describe it, a caravan with a mobile garage attached). They range in size and features from large family Caravans with dedicated storage for your equipment; large robust equipment haulers with basic accommodation/living space, down to compact off-road camper trailers. Most Toy Hauler Caravans do feature a living area with kitchen and bed, and a garage/storage space which converts into seating or more beds when needed. Another unique feature is the rear opening ramp door which serves to easily load equipment in and out of the hauler. Toy Hauler model are increasing in Australia with major brands such as Jayco and Patriot Campers leading the way. Who are Toy Hauler Caravans for? What to consider when looking for a Toy Hauler Caravan. You need to regularly transport Large Equipment or ‘Toys’ and want to include some basic accommodation. A major deciding factor is the type and the size of the equipment and accessories you want to store or transport. This will determine the size of the hauler and the amount of space dedicated to the Equipment v’s Living Quarters. A Mountain Bike and Riding Gear will take up less room than a Racing GoKart or Quad bike. HOW DIRTY WILL THE EQUIPMENT GET? This is important! Each Toy Hauler Caravan features different spaces, fixtures for securing equipment and surface types (specially to help with cleanliness and safety of your equipment during towing and storage). Will your ‘toy’ drop oil or fluids while stored and need suitable floor surfaces? Will your mountain bike be covered in mud and therefore the surfaces need to be easily cleaned or removed? Do you have a lot of fishing gear that needs to be secured while travelling? Are you looking for a Toy Hauler Caravan to just accommodate you and your equipment or are you planning to travel with four mates or family members plus equipment for everyone? How many of these people need to accommodation space in the Toy Hauler Caravan? Is comfort of driving important to you because you are taking long journey’s, or are are you needing something more robust to travel off-road or in remote locations? What is available in Australia right now. Toy Hauler Caravans and Camper Trailers are increasing in popularity – and rightfully so with a country like ours to explore! The Dreamseeker brand is sleek and sophisticated and features 2 Toy Hauler models with full adventure and entertaining in mind. The large Dreamseeker F14 Tomcat model features two-zone living space with a quad lock door separating equipment and living. The internal living quarters has premium features in both look and quality. 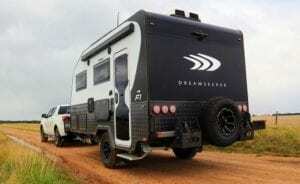 The Dreamseeker S1 is a true off-road while being sporty and affordable. You can even customise the colour top match your ‘toys’. It features a sporty exterior and true off-road capability but once inside the S1 is lavish and elegant with a contemporary use of space. Well known brand Jayco introduced their Toy Hauler model ‘Basestation’ to their range in 2008. The Basestation provides a large 11cubic metre storage space in the ‘mobile garage part’ and all the comforts of home in the ‘Caravan living area’. With the Basestation, you can take all your gear and still provide sleeping space for up to eight people. An off-road/outback option of the Basestation is also available. 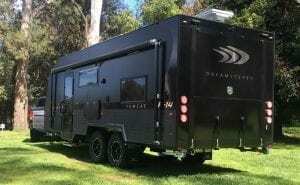 Victoria Caravan manufacturer – Caria Caravans specialise in custom built caravans and toy haulers, including one of the only Pop-Top Toy Hauler models in Australia. The Caria Evora Toy Hauler model is designed for the motorsport enthusiasts or adventure family. 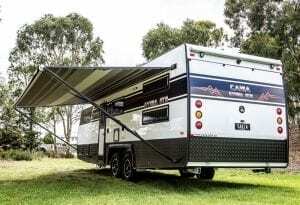 The Caria GT8 model is the only pop-top style Toy Haulers in Australia, creating a unique combination of being a 2 story toy hauler and luxury touring caravan. 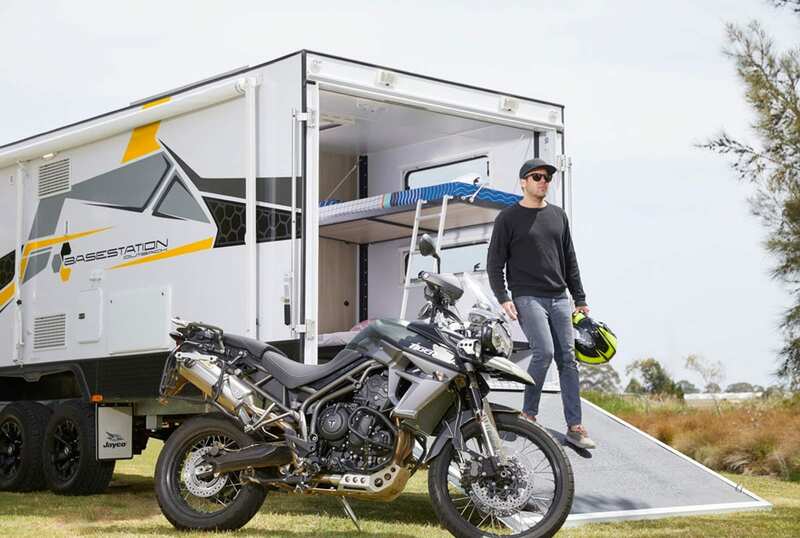 Australian company Patriot Campers are leading the way in off-road touring with their robust camper trailers, toy haulers and supertouring vehicles. 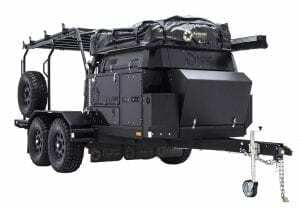 The TH610 Toy Hauler is the ultimate camper trailer for those wanting to combine their off road adventure sports with camping. 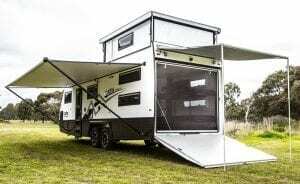 It is 6.1 mtrs long, made up of 3 mtrs of toy storage deck plus the Patriot X1 Camper at the front. 360 Finance are experts in asset finance. We have a team of specialist Caravan Finance Specialists that understand the Caravan/Toy Hauler buying process, the accessories and extras you may need or want to include with your purchase and importantly, the criteria and requirements lenders have when approving finance for a Toy Hauler, Caravan or Camper Trailer. Enquire now to find out how much you can afford before you go shopping. Our Caravan Finance Specialists will then be able to guide you through the process to get the best deal on finance so you can live life upgraded in a new Toy Hauler Caravan.